Take 2 of my purple sweet potato haupia pie was a total success! The first attempt was a disaster..pasty and starchy pie with bland crust. I knew I had to give these gorgeous purple potatoes the attention that it deserves. Now this is what I’m talkin’ about when I say “eat the rainbow”…have you seen anything so beautiful? No food dyes here kids..all natural mother nature at it’s colorful finest! I always enjoy eating purple sweet potatoes when I’m home in Hawaii, in fact my mom suggested to make them with her stuffed oranges! Wouldn’t it be so pretty to have purple sweet potato stuffed inside bright orange cups…mental note for next years Thanksgiving! In Hawaii, you’ll find Okinawan sweet potatoes, which have a very light tan skin and dark purple flesh. 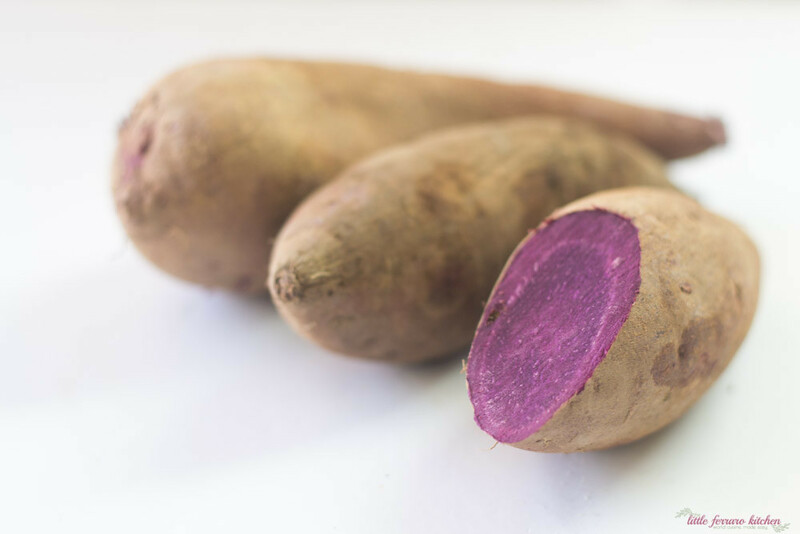 They’re hard to find here in Cali, but a good substitute are stoke’s purple potatoes, which have a darker exterior and are a bit more starchy. 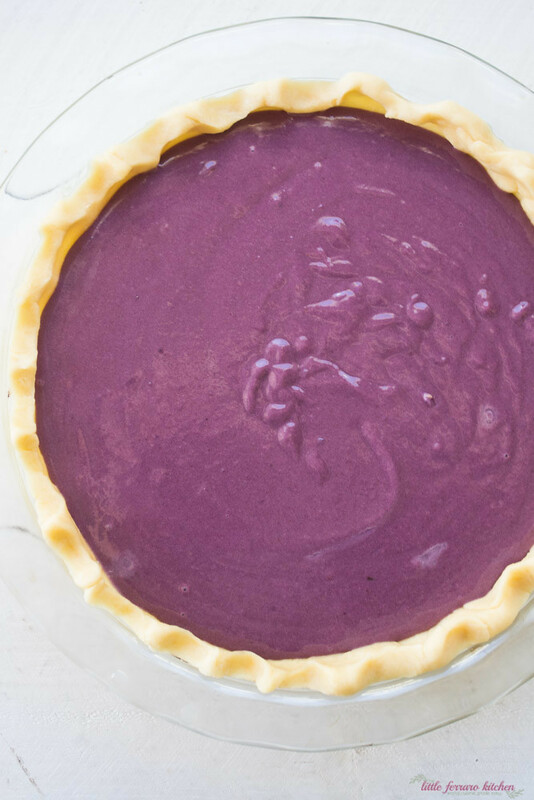 The purple hue may gray a bit when you add all your ingredients …coconut milk and evaporated milk, but is still a gorgeous contrast color. Oh..and the haupia layer totally takes the cake…well pie, actually. 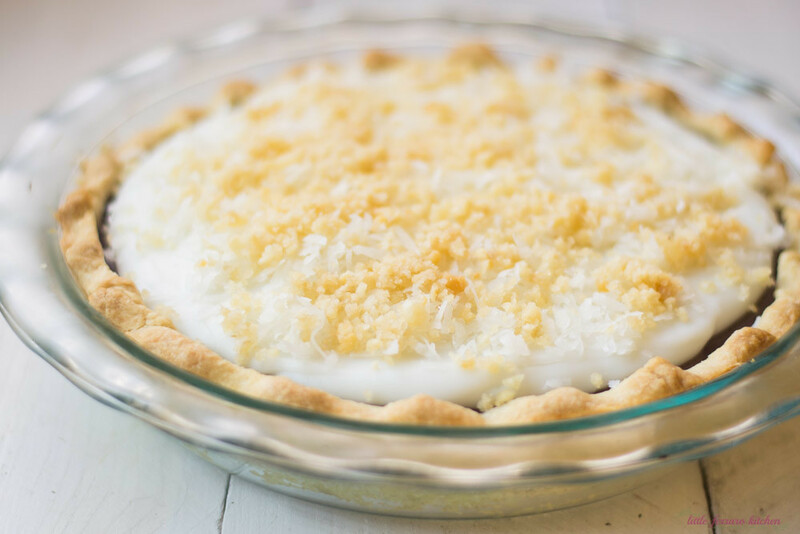 Thickened coconut milk topped with more coconut and roasted mac nuts are layered on top of the cool sweet potato pie. 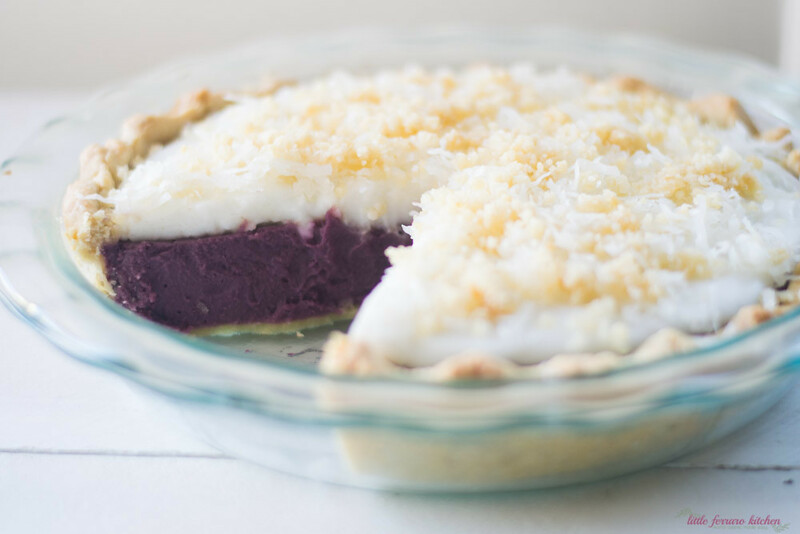 When you cut through a slice, you’ll see the beautiful rich purple layer and then topped with the thick coconut white layer. Just beautiful! I even thought about doing an orange and purple layered pie for a fun colorful twist. Mental note #2. A few cooking notes: The sweet potato pie should cool almost completely before adding the haupia layer. Once cooled, you can make the haupia which makes less than 10 minutes. Then once that is poured over, everything needs to set and chill for a few hours. I would suggest making the pie the night before and then the haupia layer the morning that you plan to serve it. 1 whole can coconut milk 13.5 oz. First make the pie crust. Cut the chilled butter into small pieces and add the flour, butter, salt and sugar to a food processor. Pulse a few times until the butter looks like small peas. Then with the motor running, slow add the cold water, a few tablespoons at a time (I used 4 Tb). The dough should begin to clump together but don't allow it to clump into a single ball. Wrap the dough in plastic wrap and form it into a smooth round disk. Place dough in fridge for at least 20 minutes (or freezer for 10-15 minutes). Next, make the filling. Boil potatoes for about 15-20 minutes until the potatoes are very soft. When done, pour water out and add potatoes to (clean) food processor. Pulse a few times to puree potatoes. Then add melted butter, evaporated and coconut milk, eggs and flavorings. Process everything together until it becomes a smooth creamy consistency. Set aside. Once pie crust is chilled, roll out to about 1/2 an inch wider than the pie dish you'll be using. Roll out on a floured surface with a floured rolling pin and fit into a 9 inch pie dish. Crimp the edge of pie into desired pattern. Pour sweet potato filling into pie shell and bake at 350 degrees F for 40-45 minutes. You will know pie is done when the crust is lightly golden brown and you can inset a knife into the potato layer and it comes out clean. If crust browns too fast, cover with foil and continue baking. Once pie is done remove from oven and allow to cool to room temperature for a few hours. Or place in fridge overnight. Once cool enough, make the haupia layer. Mix together the sugar and cornstarch in a bowl and set aside. Heat the coconut milk in a small pot until warm and then add the sugar and cornstarch and whisk constantly for about 5-8 minutes until sugar dissolves and haupia becomes thick, almost the consistency of glue (if that makes sense). Once ready, pour over sweet potato layer and top with macadamia nuts and shredded coconut. Allow pie to set and chill for several hours until haupia layer is cool. Have a healthy and happy Thanksgiving everyone! Oh yeah, I want a slice o’ THAT pie! I love purple sweet potatoes, best color ever! This pie is gorgeous. Now I REALLY wish my parents still lived in Hawaii! Two of my most favorite things into one pie?! Now to find some purple sweet potatoes here in NC…probably not! 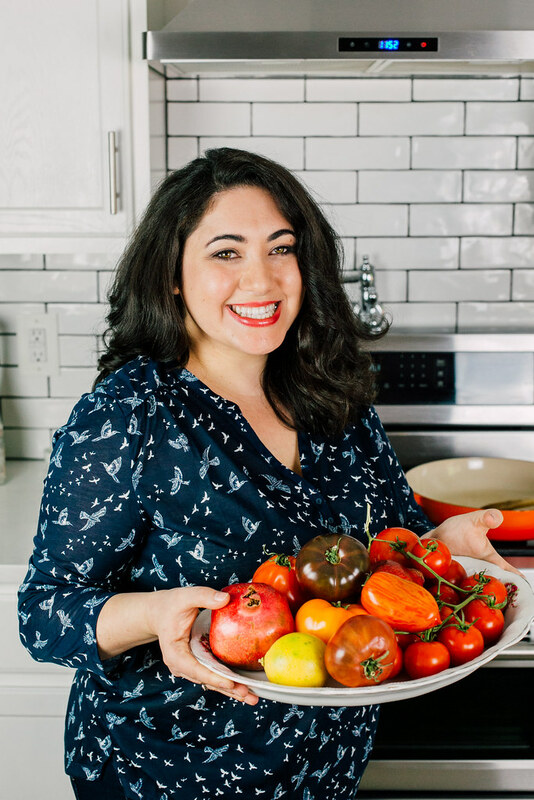 Ya never know…what about Whole Foods?? or Asian or Latin markets perhaps?? Thanks Tami! For those who find this in the future, a source is Super G Mart, W. Market Street, Greensboro, NC. There is another Super G in Charlotte, E Independence Blvd. which might have them too. This looks amazing! Have you tried it with the orange sweet potatoes? Oh no but I think it would be lovely!! In Hawaii, its traditionally made with purple but I think the orange would be lovely too. Hi! I’m living in Hawaii and for our first Thanksgiving here I wanted to make something unique and I found this recipe. It came out amazing! Thanks so much for sharing. One minor note but in your instructions, you forgot to say to mix the water with the cornstarch and sugar before pouring into the hot coconut milk. Thank you so much Patti!!! And thank you for catching that..I’ll update the recipe. Great recipe! I made this pie four times already and love it. I cut back on the sugar and I found that I liked the layer of haupia a little thinner so I scaled back the ingredients to make a thinner haupia. I don’t own a food processor so I blended the ingredients and it works ‘smoothly’ as well. I couldn’t find macadamia nuts for one of my pies but found the Hawaiian Host choco covered macadamia nuts so I chopped those up and used it; fun alternative. 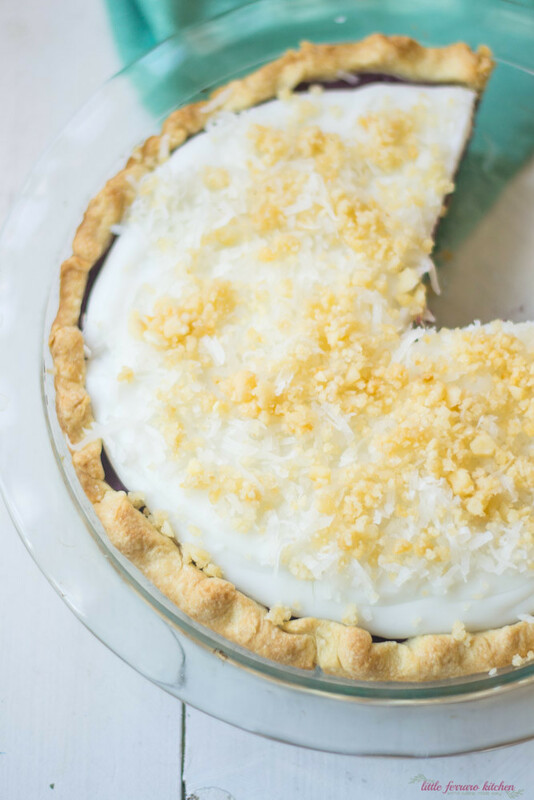 TOASTING the shredded coconut topping is a must! Thank you so much for sharing Molly!!! And great idea on the chocolate covered mac nuts…genius!! !